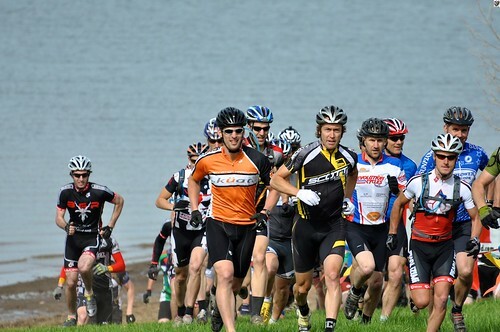 This Sunday was the 2nd annual Bone Bender 3/6 hour mountain bike race at the Smithville Lake MTB trails in Paradise MO. It was the first event in the United Federation of Dirt's endurance league. The day started early with a 4:30 alarm but when I arrived at the race site with Jesse, Lori and Chris an hour before the 10 am start time I was feeling good and ready to race. There were a TON of people milling around and the whole place had a big time vibe to it. I was actually looking forward to getting started. Since I pre-registered online getting my race packet was a breeze and it seemed like the time between arriving and toeing the line for the LeMans start flew by. There were 89 people doing the solo 6 hour race with everyone else divided up between the 3 hour and team events. I got a good start and made it to the singletrack in the top 15 or so. The race course was mostly singletrack with short connecting sections of paved trail. The dirt was completely dry and the riding on the first lap was crowded and fast. If someone allowed a gap to form in front of them they were quickly passed by several people. 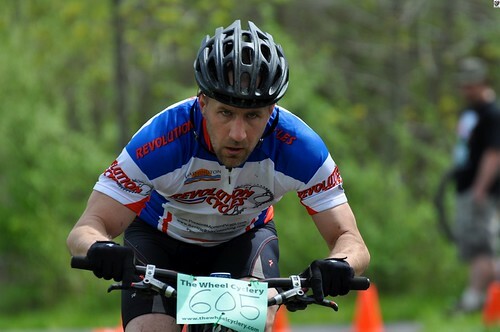 I really like riding wheel to wheel at the start of races. Once you get into the flow people are chatting about conditions, how many laps we're going to do or whatever and it's just a lot of fun. There were a few sections of the trail I didn't like, where we were on the side of a hill with VERY rocky/sketchy conditions but for the most part the course was fun with many twists and turns. It seemed like just when you'd get up to speed there would be an S turn thrown at you. I settled in at a pretty good pace and finished the first lap in under an hour. They used a color code for the number plates so you could tell who the other 6 hour solo riders were; I only needed to worry about the green ones. At the end of the lap there was a 2 way section of paved trail so you could easily see how far ahead of you the next rider was. For the race I mixed several 1 hour bottles of hammer perpetuem and endurolyte so I just pulled over and grabbed a full bottle out of my cooler at the beginning of each lap. That meant I only had to stop for a few seconds. 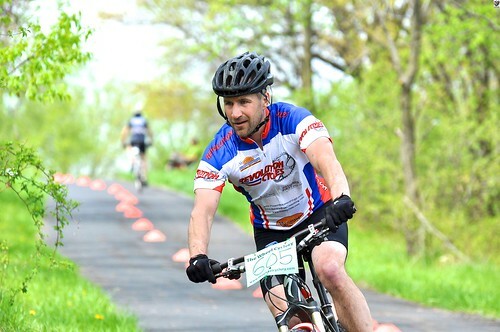 On the second lap the crowd started thinning out and I found myself riding alone most of the time. On one of the deep ditch crossings when I hit the bottom my seat shifted where the nose came up a half inch or so. It wasn't that big of a change but the sensation threw me off for awhile and I found myself standing up much more than usual. I could have fixed it at the end of the lap but I didn't want to spend the time on it and just left it alone. 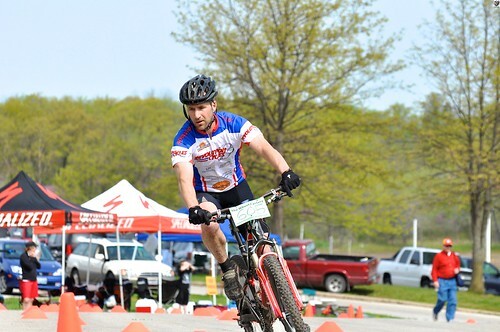 On the third lap I started catching some of the lapped riders which made the race quite a bit more challenging. When you are traveling at a higher rate of speed you can catch people off guard and it makes passing cleanly a little tricky. A couple times I saw people wreck trying to get off the trail so I could pass. One guy came to a stop on the downhill side of the trail, didn't un-clip and flopped over. He wasn't hurt, just embarrassed. After the 3 hour riders finished the trail got much less crowded and it became more about refueling and concentrating on going as hard as I could and not letting me turn the day into a casual ride. The end of the 5th and start of the 6th lap was the hardest; I wasn't feeling very energetic and my lower back was aching quite a bit. I was having to sit up on the paved sections to give my back a break. During that time I was passed by Kip Biese and I was struggling to keep him in sight. I REALLY didn't want to do 7 laps and I knew I'd be finishing the 6th lap right around the 6 hour mark and I decided that if I finished under 6 hours I'd go out if I was within a few minutes of the rider in front of me; otherwise I'd wait to see what the rider after me was going to do. About 3 or 4 miles into the 6th lap I got a surge of energy and started feeling really good. The rest of the lap was fun and I finished strong pulling to within a few seconds of Kip to finish the 6 laps in 6 hours and 18 seconds. That was good enough for 4th overall out of the 6 hour solo crowd and 3rd in the 35+ class. After the race I felt pretty wiped out. It's funny how you can go from feeling fine while riding to feeling like crap once you stop. The post-race festivities were fun, it's always great to get to hang out with other riders and the post-race steak at Long Horn Steakhouse was delicious! 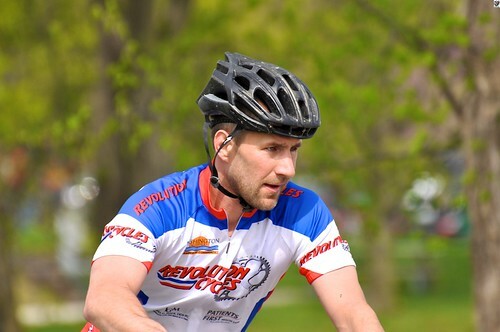 Thanks to Cowtown cycling and all the earth riders crew for building such great trails and putting on such a great race. I had a blast and I'll be back. This weekend I'll be at Tour de Tick and then Syllamo's Revenge! Loved your article about the race. We are very proud of you for both your writing and your riding. Enjoy reading about your adventures.